Shortcake Whirls with a Vanilla Flavour Filling (18%) and Raspberry Jam (11%). Exceedingly good cakes. 100% natural flavours & no artificial colours. No hydrogenated fat. Suitable for vegetarians. 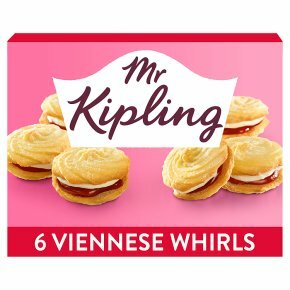 Nation's favourite* *Mr Kipling Viennese Whirls are the No. 1 best-selling Viennese Whirls. Source: IRI Grocery Outlets Market Data for Great Britain, 52 weeks up to and including w/e 02.12.2017 Light shortbread swirl filled with fruity raspberry jam & a smooth creme filling It's the little things that mean the most like an exceedingly good cake from Mr Kipling.